You know the old saying “one man’s junk is another man’s treasure”? This sentiment rings true throughout the world of aviation. The certification requirements and miniscule production runs of airplane components ensures everything from crumpled, rusted out airframe scraps in a bone yard to a run-out cylinder or decapitated taxiway light retains value. Oh, sometimes the lucky detritus is refurbished and lives on as part of an airworthy airplane, but just as often the bits end up elsewhere. And I’m not referring to the traditional recycling process, although I’ve no doubt that many stout airframes have suffered the indignity of rebirth as a beer can. Instead, the aforementioned red-tagged cylinder becomes a kitschy planter. That busted taxiway light is transformed into an accent light for the office. Cockpit instruments become classroom visual aids. It’s not just for parts, either — complete aircraft have found new life as lawn ornaments, restaurants, water slides, museum pieces, and even family homes. In 2004, the Discovery Channel aired “Wing Nuts”, a short-lived series about a firm that turns airplane junk into artistic treasure. I don’t remember much about the show — it only lasted one season — but the company, MotoArt, is still in business. They transform aircraft parts into imaginative yet functional furniture. Beds, desks, tables, chairs, bars, and so on. Even the briefest of glances at their web site will demonstrate the love and passion Motoart puts into their deliciously elegant products, but before you fall in love, be warned: they don’t come cheap! The first clue is the total lack of pricing information on their site. “Call for price” has never really been synonymous with “inexpensive”, has it? The item which always catches my eye there is a Gulfstream II desk. 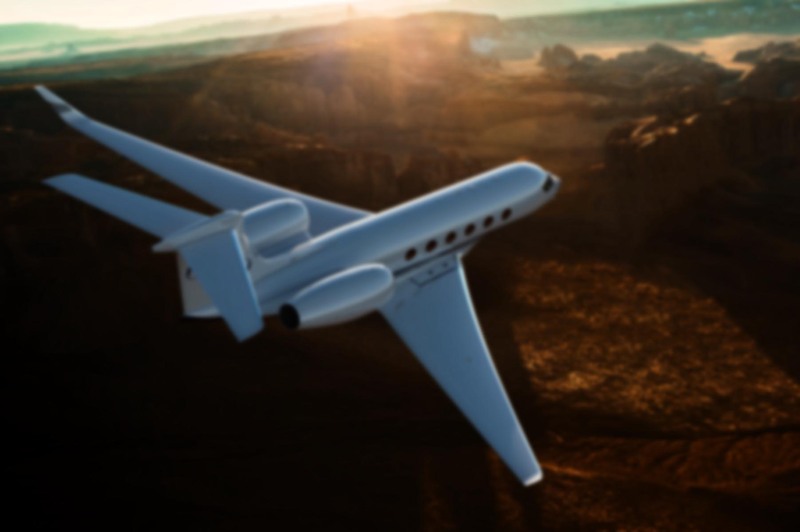 It consists of the outerboard-most eight to fifteen feet of a Gulfstream II wing in bare metal, polished to a high shine and covered with a matching top layer of glass. Why the G-II? I assume it’s because the winglet on later models would render the conversion a bit more challenging. The wingtip is the beautiful part of the airfoil, not to mention the only place where the wing is narrow enough to be useable as a desk. The inboard portions are too wide and thick to be serviceable as a piece of furniture; that’s a hurdle I doubt even Motoart can overcome. This might be the world’s most well-traveled desk. And for $18,900, it should be! Since I fly Gulfstreams, it feels mildly gruesome coveting such an item, especially after my recent paean to the first G-II jet and the majestic post-flying treatment it’s received. But the truth is that most retired airplanes — even Gulfstreams — will be parted out or end up in a bone yard somewhere. One could argue that the desk represents a more dignified fate than simply leaving the carcass of a once proud airplane outside to fade and rot under the harsh UV as it’s covered with excrement by nesting birds. It’s a moot point anyway; I inquired about the cost of the desk and was quoted $18,900… for the small one. 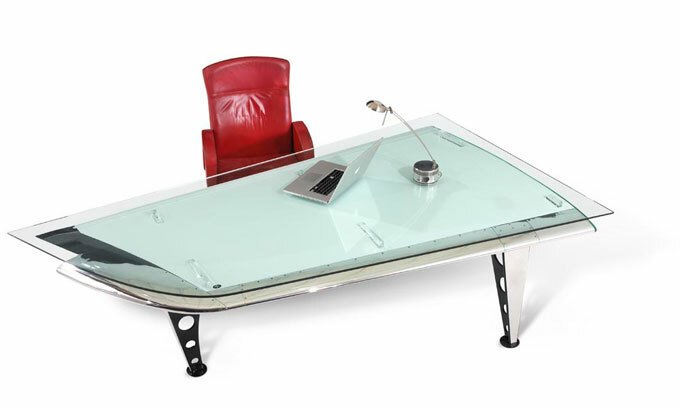 Can you imagine how much the fourteen foot long DC-4 conference table would command? Still, a guy can wish, can’t he? Since Christmas is just around the corner, I dropped a hint to my wife about the radial piston lamp, a relative bargain at $165.00. But I’m not too hung up on it. Motoart’s products are delightful, but no desk could ever beat the experience of actually flying these birds. That’s the greatest gift of all. But I agree, using these parts for their intended purpose is a far better gift. Since you work on your own airplane, I bet you could bypass Motoart completely and roll your own. If you can do it for an entire airplane, why not a single part? Maybe an old cylinder. Or if you ever need to replace a cracked skin or re-work your instrument panel, you could turn the pieces into art. Everything on your bird is already polished to the N-th degree anyway, so as I see it you’re already halfway there with any parts you replace! Sadly, my favorite line of yours is also probably only too true: “I’ve no doubt that many stout airframes have suffered the indignity of rebirth as a beer can.” The dry, sunny climes in Arizona make my home state a mecca for aircraft boneyards. I can easily spot hundreds from the air. I can’t think of a more dignified fate for our beloved machines than as recycled art. I for one will personally donate $20 toward the purchase of your $18k desk. MERRY CHRISTMAS! Who’s with me?! The boneyards out there are a-mazing. And aircraft owners who live in Arizona are sure to avoid the corrosion issues we have to deal with along the coast. I’ve never been to Davis-Monthan, but it’s on my list. Boneyards are cool and sad at the same time. At least DM keeps planes in semi-airworthy condition. Speaking of which, I have a great story about a wrong airport landing, an airliner, a boneyard, and an aerobatic contest that all intersected at the same time, but I’ll save that for a full post. Welcome to the club, buddy; I tell myself the same thing every day. 🙂 Then there’s the little voice in my head that goes, “Yeah, but you spend so much time at your desk…”. I haven’t been to the Kaiser there, but that 747 cowling desk is one the items listed in Motoart’s catalog. I assume it looked something like this? I like aviation kitsch. I work under the downwind of KDVT 7L/25R, so I decorated my office with a stick-and-tissue model of a Piper Cub, some aviation posters, and cheap instruments I bought at EAA fly-ins. An old school “gyro horizon,” an ASI (in MPH), and an old fashioned turn/bank indicator (no doghouses!) look really neat sitting on the book shelf. The kitsch serves to make my office look nice, and as an added bonus, reminds me that I’d rather be up there than down here. Ok, maybe that’s not a bonus. I did not know about that! What a strange place for it, the parking lot of a hospital. I was aware of the space shuttle mockup. They used that during the Rockwell/Boeing years for fit-ups and whatnot. After it became Downey Studios they didn’t know where to put it, so it stayed in the building as I recall. But talking with a former astronaut and doing all the rest? For five bucks? I’m there! Oh geeze… I’ve never seen this before, and i’m salivating. Loving those desks! Start saving those pennies, Kevin! Try out “Kelly’s Carribean Bar&Grill” in Key West. Their bar is a DC-3 wing…………. I once ate at an airport cafe in Northern California which used an F-16 canopy as the sneeze guard for their salad bar. As I recall, there is a beautiful 727 turned into a house on a hillside in or near Malibu! My guess is that it is the portion of the GII wing that must be removed when a plane gets a winglet mod.